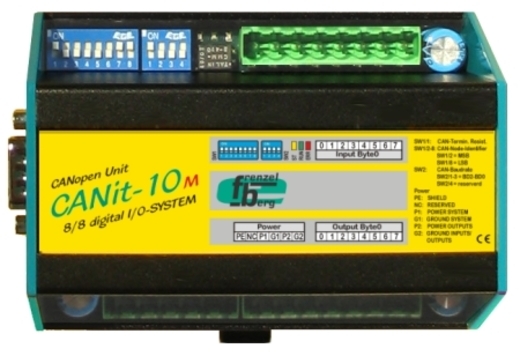 The CANopen units CANit-10 and CANit-20 are general purpose CANopen remote I/O modules with 8/16 digital inputs and 8/16 digital outputs for 24 VDC. They are especially designed for easily connecting almost all kinds of sensors and actuators to a CANopen-network. There is no necessity of making any program. The CANit-units have separated power supplies for the system/bus and the I/Os. All I/Os by Frenzel + Berg are positive switching and opto-isolated from bus and system supply. The outputs are short-circuit-protected and output overload monitoring is supported. Different bit-rates up to 1 Mbit are possible. The CAN-connectors are at the side and rail mounting allow to align the CAN units directly, without using a CAN-cable between each other. The CANit-10/20 I/O modules are available as an open frame PCB, in a front side opened plastics enclosure or in a closed aluminum enclosure. Both enclosures are suitable for mounting on carrier rail.